Since Notre Dame defeated Georgia Tech by 21 points in Atlanta early in ACC play, the Yellow Jackets have lost 4 of their next 6 conference games. The most recent loss was a Thursday night heartbreaker — 91-90 at North Carolina. Down three points with eight seconds on the clock after two free throws by UNC’s Paris Kea, the Yellow Jackets’ freshman star Elizabeth Balogun was fouled attempting a three-point shot with two seconds left. She made all three to knot the score at 90. UNC’s Janelle Bailey was fouled with one second remaining, and after missing the first Bailey made the second free throw to win the game for the Tar Heels. This most recent loss drops the Yellow Jackets to 3-5 in the ACC and 13-8 overall. Three of their other losses have come to top ten teams — at home to the Irish (by 21) at Louisville (by 17) and NC State (by 8) at home. Sunday’s noon rematch between Georgia Tech and Notre Dame will be the first Irish home game in two weeks. In the first games on January 6th, the Irish used a career-high 12 assists from Arike Ogunbowale to help the Irish shoot 54.8% from the field. In all, the Irish had 30 assists on 34 made baskets as the Irish scored 60 of their 76 points in the paint. Georgia Tech only managed 20 paint points and shot 36.1% for the game. All ND starters scored in double figures led by Jess Shepard’s 19. Ogunbowale tallied 13, even though she only made 5 of 17 field goal attempts. The other four starters were 23 of 34 from the field (67.6%). Brianna Turner and Marina Mabrey had 11 points each and Jackie Young ten. The Irish made 33 of 52 two-point attempts (63.5%) after going 1 for 10 from beyond the arc. ND outscored Georgia Tech 24 to 9 on fast break points and turned 20 Yellow Jacket turnovers into 33 points. Tech scored just 13 following 14 Irish giveaways. Since Notre Dame limited Georgia Tech to 55 points in the first game, the Jackets’ points per game average has dipped from 73.1 points per game in early January to 70.0 points. Their field goal percentage has dipped slightly to 40.5%. Georgia Tech’s leading scorer continues to be freshman, Elizabeth Balogun, at 16.3 points, who tallied 35 in the close loss to North Carolina. The McDonald’s All American went 6 of 12 from beyond the arc and played all 40 minutes of the game. She also had 5 rebounds, 5 assists and 3 steals. Balogun led scoring against the Irish with 14 in the first matchup this season. Junior Francesca Pan had 10 against ND, she averages 11.8 for the season and 6’5” freshman, Elizabeth Dixon, was the only other double-figure scorer against ND with 12. She averages 9.7 points and 6.7 rebounds for the season. Pan is joined on the team by fellow Italian Lorela Cubaj, a 6’4” forward, who scores 7.2 points and collects 6.9 rebounds per game. Cubaj played 34 minutes against UNC and scored 17 points (8-11 from the field) and collected 12 rebounds. Sophomore guard Kierra Fletcher adds 9.3 points and 5.6 rebounds. Irish Notes: There has been more than a little angst (for solid reasons) among some ISD posters about the lineup ND will put on the floor next season. And, that concern will go up to eleven if Jackie Young decides to declare for the WNBA draft after this season instead of returning for her senior year. Since she turns 22 this year, she is eligible to declare for the draft. As an exercise, I thought it would be interesting to look at what the lineups last season and this would have been had ND not suffered injuries and had transfers (both in and out). Brianna Turner’s ACL injury in the 2017 NCAA tournament sidelined her for all of last season, which made securing the transfer of Jessica Shepard so important. It’s unlikely the Irish could have won the national championship without Jess, and her immediate availability after transferring from Nebraska was crucial to the championship run. Without the injuries and transfers last season, the Irish would have had three seniors (Turner, Kat Westbeld, and Mychal Johnson), three juniors (Arike Ogunbowale, Marina Mabrey and Ali Patberg), two sophomores (Jackie Young and Erin Boley), and two freshmen (Dani Patterson and Mikki Vaughn). It was shaping up to be Notre Dame’s most talented roster — ten players with eight of them McDonald’s All Americans. Patberg was recruited to play point guard and Boley as a sharp-shooting wing. Both were gone before last summer, and with Turner’s injury, necessitated the transfers in of Shepard and Lili Thompson, as well as the return of Kristina Nelson for a fifth year. Moving ahead to this season, barring injury and transfer, the Irish would have had three seniors (Ogunbowale, Mabrey and Patburg), two juniors (Young and Boley), two sophomores (Patterson and Vaughn) and four freshmen (Jordan Nixon, Katlyn Gilbert, Danielle Cosgrove and Abby Prohaska). This would have been a talented line up with eight McDonald’s All Americans among the eleven players. However, they would have lacked the experienced post presence this year's team has with Turner and Shepard. Would this seasons’ Irish be a better team without them and with an experienced point guard in Patberg? Would they be shooting and making more threes with Boley? Everything worked out magically well for ND last season — from the immediate availability of Shepard, the strong play of the three guards, the heady play and ‘glue’ that Westbeld delivered, and the return of Nelson to provide critical minutes of rest for Shepard. Even walk-on Kaitlin Cole played an important role in a number of games after Thompson and Johnson suffered season-ending knee injuries. This season’s starting five is arguably the most talented ever at Notre Dame — and according to a mock WNBA draft that ESPN published this week, all five are expected to be drafted with Jackie Young going the highest as the sixth pick should she decide to forego her senior season. This team has the talent and potential to win the championship again. However, Sunday’s loss at North Carolina demonstrated how fragile those prospects are if one of the starting five is sidelined. As it stands now, ND will only have nine scholarship players on the roster next season: one senior (Jackie Young), two juniors (Patterson and Vaughn), four sophomores (Nixon, Gilbert, Cosgrove and Prohaska) and two freshmen (Samantha Brunelle and Anaya Peoples). Of the nine, six are McDonald’s All Americans, which makes them a talented group, but there are critical questions to be answered. Will Jackie Young return? Will Patterson and Vaughn be effective and productive in the low and high post? Will Nixon develop into a steady point guard and scorer? Will Gilbert and her repaired shoulder produce needed offensive and defensive punch at guard? Will the two talented freshmen make an immediate and sustained impact? 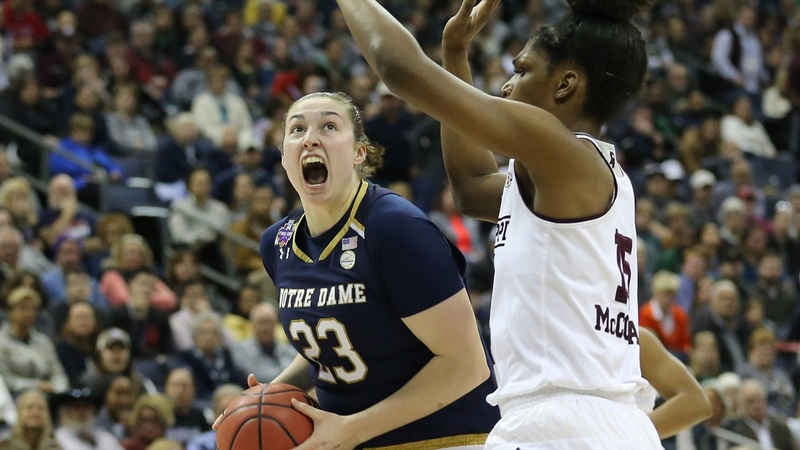 And, perhaps most importantly, can Muffet McGraw uncover a talented transfer or two or perhaps an international player to complement the current projected line-up? She struck gold with Jess Shepard — can she do it again? Given the changes to the anticipated rosters the last two seasons through injuries and defections, it’s likely the Irish will work hard to find another player or two to add to next season’s mix. And, as the loss to North Carolina demonstrated, everyone should worry more about the Irish maximizing this year’s talent than fretting about next season’s lineup. There will be ample time for that later. Sunday’s game tips off at noon. It will be streamed via the ACCN and available on the ESPN app. In-game updates will be posted below.